CNN recently did a story about Dr. Lynn Webster and the investigations related to his patients. After watching the video, I am sure you will be a tad disturbed. What is even more disturbing is the fact that this same doctor developed the opioid risk tool which is in our Canadian opioid prescribing guidelines for chronic non cancer pain. See page 12. This tool is used across Canada to help determine someones eligibility for opioid treatment and is mentioned in the video clip above. There is now an app that includes Dr. Lynn Websters opioid risk tool which is also being used by doctors across Canada. Now here is the icing on the cake! Our Nova Scotia Prescription Monitoring Programs medical consultant, Dr Peter MacDougall thinks this great and will help in safely and effectively administering opioids. Dr. Peter MacDougall’s quote does not refer to his position at the Prescription Monitoring Program which was the focus of a scathing report from the Auditor General , but it does refernce his position as the Director of the Nova Scotia Chronic Pain Collaborative Care Network. This network gets funding by Purdue Pharma ( the maker of Oxycontin, Dilaudid, and other opoiod narcotics) as well as Phizer. These are tremendous conflicts of interest in my opinion and i can draw conclusions as to why our N.S. 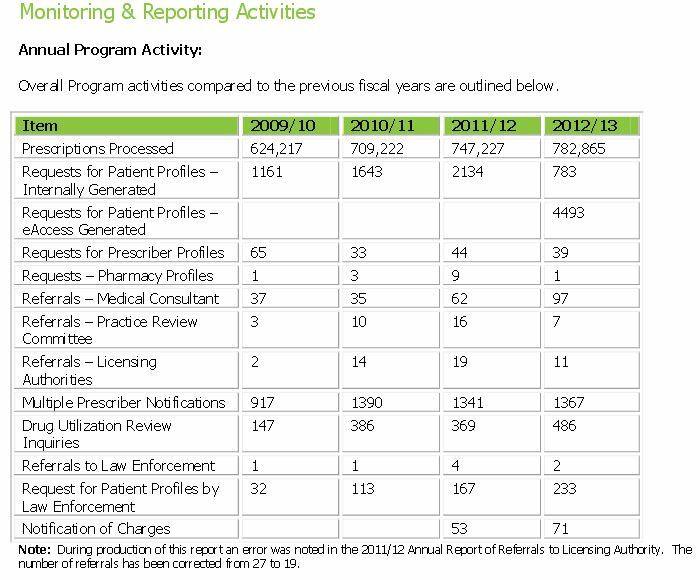 Prescription Monitoring Program is simply collecting lots of data but doing very little with it. Last year there were only two referrals to law enforcement out of the 782,865 narcotic prescriptions processed. Law enforcement requested to see 233 patient profiles which can only be done with reasonable cause. Patient profiles are an information file that contains all the prescribing information for a particular patient. They contain things such as the types of narcotics they are prescribed , by what doctor, dosage ect. These can only be accessed by police, doctors, and pharmacists with reasonable cause.There has been a 628% increase in law enforcement officials requesting patient profiles over the past four years. Narcotic prescriptions processed by the program have also risen by 25% over the same period of time; however referrals to the practice review committee or licensing authorities have remained relatively constant and have sometimes even declined. Why does Prescription Monitoring seem like a silent bystander while prescriptions continue to rise as well as double doctoring? Should doctors who have relationships with opioid manufacturers be creating guidelines for the prescribing of opioids or hold key positions in prescription monitoring programs? Should our doctors be using a tool created by Dr Lynn Webster for prescribing opioids when he has had over 20 patients overdose from their own prescriptions? What is wrong with this picture? “The war against illegal drug use has been going on for decades, but now it seems the “war on drugs” should have a new target… Legal drug addiction is taking lives in record numbers. In the UK, 1 million people are addicted to over-the-counter (OTC) and prescription painkillers and tranquilizers; that’s significantly more than the number addicted to illegal drugs. In the US, it’s a similar story. There were four times more deaths among women from prescription painkiller overdose than for cocaine and heroin deaths combined in 2010.